It really can be a way of life; the silence of the wilderness, an empowering recreational outdoor activities and the relaxed way of life. 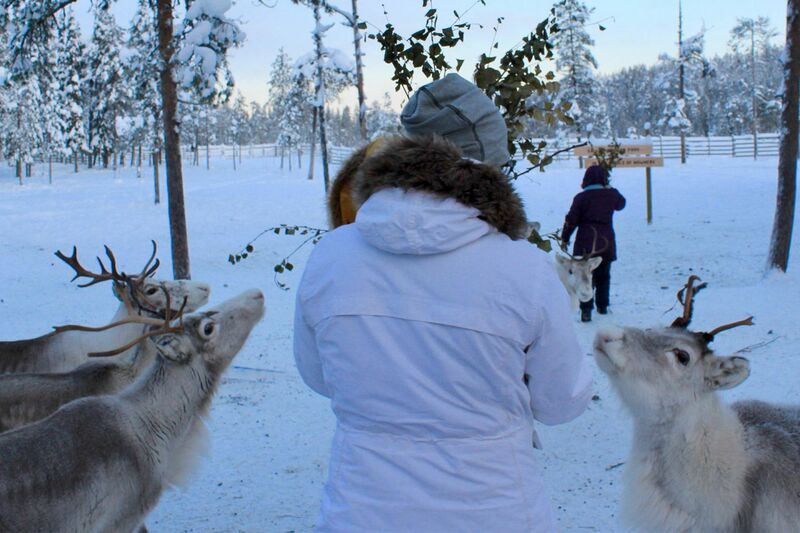 In Salla everyone knows each other, even the members of the reindeer herd. Safari guide Jarko Kallioinen stacks blankets in a snowmobile sledge in the Salla Reindeer Park, a reindeer farm and activity center in eastern Lapland. Soon he’ll drive a group of five into the snowy pine forest to see 17 mother reindeer and their eight-month-old calves. There, in the middle of nowhere, they may encounter a lonely grouse peeking behind a tree, or a brown wood mouse dashing across the top of the snow. The branches of the pines drape with grey beard lichen. In a while, Jarko will tell the group that lichen is an Arctic plant that grows only where the air is absolutely pure and pristine. It is also the reindeer’s favorite snack. – You can take pictures and feed them dried leaves. In the meantime, I promise I’ll tell you everything I know about the reindeer and their lives, Jarko says. Jarko, 46, originally hails from Salla. Although he does not herd reindeer himself, he knows quite a bit about Santa’s furry helpers. 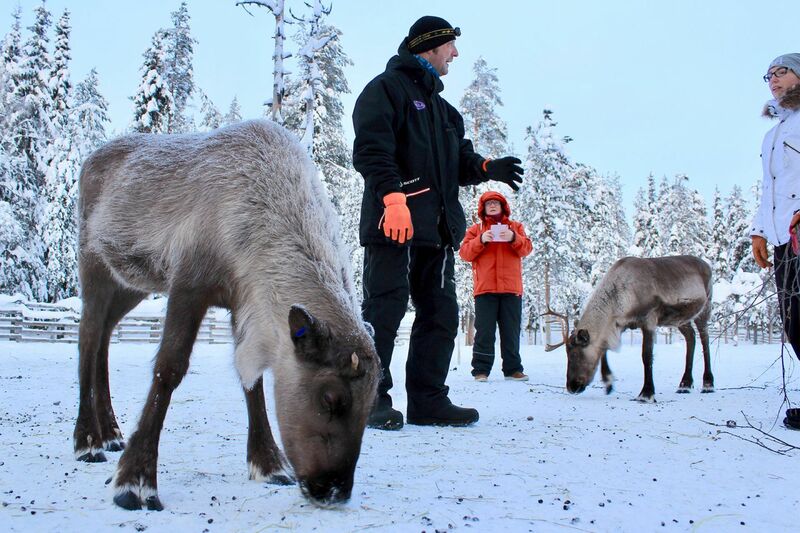 – Reindeer are semi-domesticated animals, that we herd in the wild here in Lapland. Each reindeer has an earmark indicating owner. Reindeer antlers regrow annually, and bears, wolverines, golden eagles and road traffic are reindeer’s most severe threats, he says. According to Jarko, a reindeer’s life can be quite stressful, especially if you happen to be a male with huge antlers. – One male can have a harem of up to 40 females. It can be a real burden trying to keep competing males away, he says. 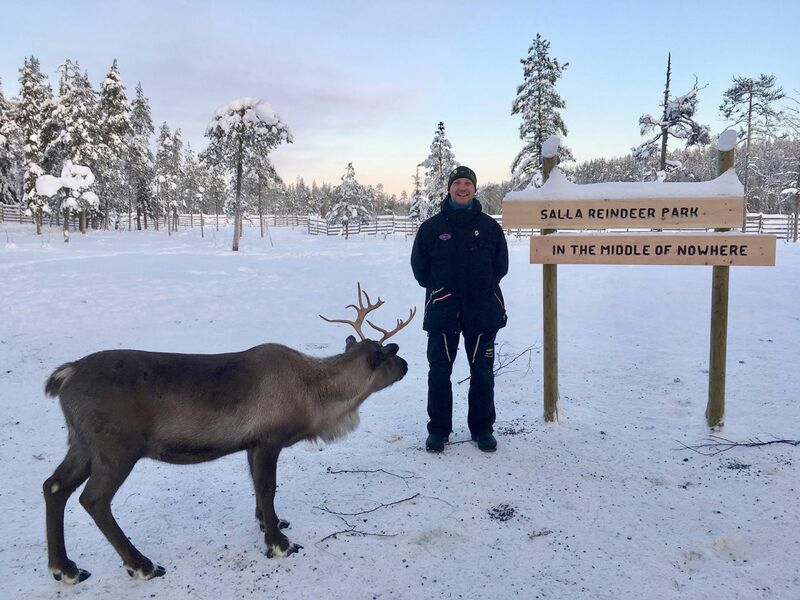 Jarko knows almost all the reindeer in the farm–not only by their names, but also their personalities. – Räikkonen, for instance, doesn’t like you to come too close. He may use his antlers to push you away. Urpo, however, likes to pose for the camera, sometimes even cheek by cheek. Kurvari is a guy you can trust, no matter what. He always behaves well. 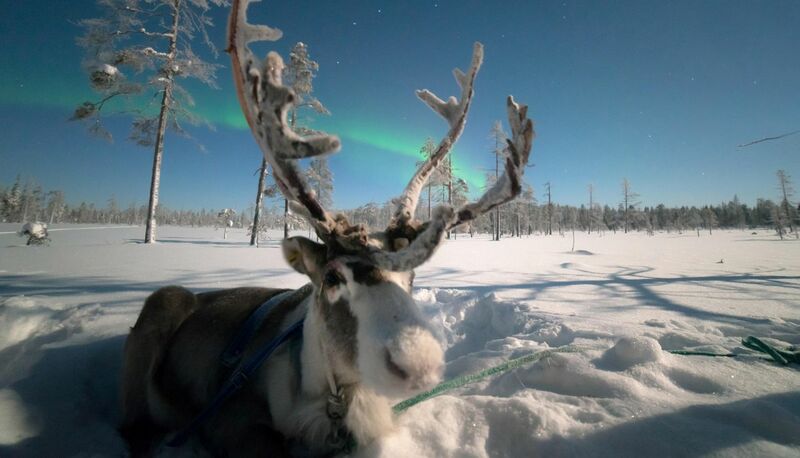 In addition to the reindeer, Jarko knows almost everybody who lives in the small town of Salla. He ran the town’s biggest grocery store for years, before deciding to try something totally new. – I love my job, because I can use all the skills I’ve obtained in life so far: snowmobiling, chopping wood, feeding reindeer … Plus I get to meet people from all over the world and tell them about life here in Lapland. I enjoy that a lot. Salla is a small town of 3600 inhabitants in the eastern Lapland, near the Arctic Circle and the Russian border. If you look at Salla from the air, you’ll see forest, forest and more forest. Many of those who have visited Salla once keep coming back. Such as Sabrina Giofré from the Netherlands. This is her 15th time visiting Salla. – I love to come back because it’s so quiet here. This silence is something I have never experienced anywhere else. The atmosphere is relaxed, and everything is so clean. People really respect the environment here, she says. Next summer, when Sabrina returns to Salla, she plans to go canoeing, hiking and river rafting. Jarko agrees with her: Salla is the perfect place for those who enjoy tranquility and the great outdoors. – Hiking, fishing, picking bilberries and hearing absolutely nothing – those are the kind of things people coming from big cities truly enjoy, Jarko says. Everything is now ready and set. Jarko helps five ladies climb into the sledge and then jumps onto the snowmobile. He covers them with warm blankets, and the snowmobile and the sledge disappear into the snowy pine forest. Want to know what kalppinokka, nutukas or takkahärkä means? Check out the reindeer brochure. You’ll learn plenty of facts about this fascinating creature also known as Rangifer tarandus tarandus.